This page contains sample scores and audio with basic Candombe rhythm patterns on the traditional Chico, Repique and piano drums, and rhythm samples on drumset and bass for styles like Candombe Song and Candombe Funk. To listen to the examples in Real Audio TM format you must have RealPlayer®. If you do not have it installed, you can download it free of charge from here. The audio samples can be heard by clicking on the scores. 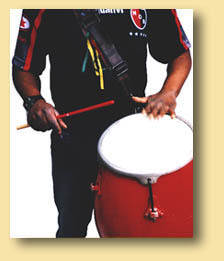 'The Madera' (Wood) is the name for the rhythmic 'Clave' (Key) to Candombe, and it is the rhythm played by the percussionist on the side or shell of the drum with the drumstick. 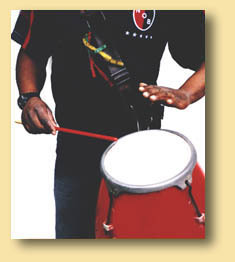 The Chico drum gives structure to the Candombe rhythm. It is a high pitched drum and is responsible in the drum 'Cuerda' or ensemble for maintaining a uniform and continuous beat. It is played by heavily striking the drumskin near the edge with four fingers of one hand, the other hand striking with the drumstick in the middle of the skin. 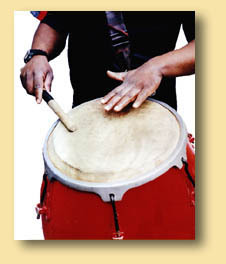 This low-pitched drum is the foundation for the Candombe rhythm. The basic ways of beating this drum are: drumstick and hand striking the drumskin in unison, producing a sound which may be accentuated, open or muted at the drummer's discretion; and the hand alone striking the skin. 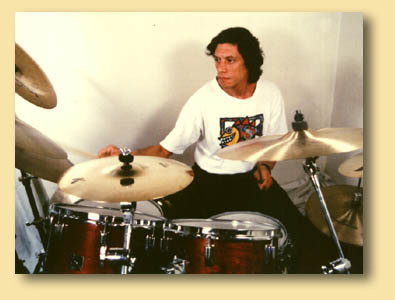 The Repique drum improvises short and varied bursts of rhythm, inserting them in the prevailing overall rhythm. The Repique drum, like the other two, is played with one drumstick and one free hand. This drum gives out three basic sounds: one is produced by the hand striking the drumskin loudly, another by the drumstick striking the drumskin and the third by the drumstick striking the shell or the upper edge of the drum. There is a characteristic rhythm to the Repique drumbeat. 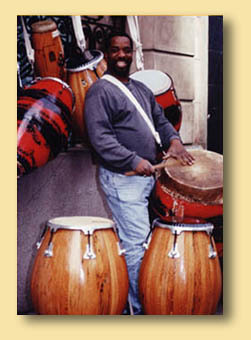 In musical groups (or bands), it is common to use tumbadoras (congas) instead of the chico, repique and piano drums. Back in the mid-50s, when Jazz, Rock and Roll, Bossa Nova, etc., were developing, Uruguayan musicians began to develop a characteristic style of music of their own, based on those new musical trends but merged with Candombe. Thus Candombe was no longer just a Carnival style of rhythm, but became a part of Uruguayan music. Some memorable bands were formed during the years that followed, The Shakers and El Kinto in the 60s, Totem in the 70s and Opa Trio in the 80s, were among the most important. Rhythm pattern created by Willy Muñoz, playing the Piano Drum rhythm on the Toms. CAs mentioned earlier, during the mid-50s Candombe began to merge with musical trends of the time, but it was towards the end of the 60s when the genre really began to take shape in Bass. 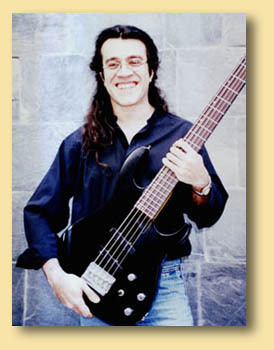 Specifically in Example 1 below we find a line of Bass that can be considered basic or traditional. Here and advanced form of 'Slap' is used, involving a combination of 'Hammer' and 'Tapping'. "Paland" , composed by Jorje Sadi and Willy Muñoz.